Mumbai: Housing Development Finance Corp. Ltd (HDFC) has posted a 20% increase in net profit in the September quarter, riding on firm demand for home loans and recording only a marginal drop in margins despite rising interest rates. HDFC’s shares ended at ₹ 672.65 on the Bombay Stock Exchange, up 0.95% from Friday’s close, while the exchange’s benchmark 30-share index, the Sensex, fell 0.34% to close to 17,025.09 points. Vice-chairman and managing director Keki Mistry said demand for home loans continued to be strong across the country except Mumbai. “In the other cities, there is demand for loans, especially from the outskirts," Mistry said. “We are guiding for a 18-20% growth in loans for the rest of the year." So far in fiscal 2011-12, demand for loans has increased 18%, HDFC said. Its margin has shrunk by 5 basis points (bps) to 2.29%, compared with 2.34% in September 2010, even though the cost of funds increased to 9.26% from 7.6%. A basis point is one-hundredth of a percentage point. This was made possible because of a rise in loan rates. In August, HDFC had raised its retail prime lending rate, the benchmark rate for home loans, by 50 bps to 16.5%. The benchmark rates are at their highest in the lender’s history. Non-banking finance companies such as HDFC, who depend on wholesale deposits for funding needs, have seen the cost of borrowings increase because of the hikes in policy rates by the Reserve Bank of India. The Indian central bank has raised its key policy rate 12 times, by a total of 500 bps, since March 2010, to tame persistently high inflation in the world’s second fastest growing major economy after China. “We have a matched balancesheet, so the results have been in line with expectations," Mistry said. “Excluding loans sold, our loan book has grown by 19%." As of 30 September, HDFC’s loan book stood at ₹ 1.26 trillion, compared with ₹ 1.06 trillion a year ago. “Loans sold during the preceding 12 months amounted to ₹ 4,989 crore. The growth in the loan book inclusive of loans sold is 24%," the company said in a statement. 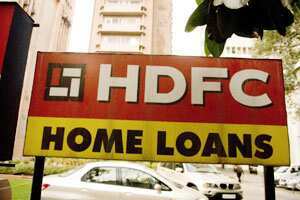 HDFC, however, did not share the increase in loan disbursements and approvals during the quarter. Santosh Singh, an analyst at Espirito Santo Securities, said home loan demand is still robust in India except in pockets such as Mumbai and the National Capital Region. “Even in Mumbai, home loan demand has sagged only in the island city," he said. “Places like Bangalore, Hyderabd and Pune, which have seen no price increases in the last few months, are seeing demand for loans." Besides income from giving loans, HDFC also earned ₹ 86.88 crore from the sale of its investment in business process outsourcing company Intelenet Global Services Pvt. Ltd in May. HDFC sold its 5% stake in Intelenet to UK’s Serco Group Plc. “We sell our investments from time to time and have unrealized gains amounting to ₹ 21,335 crore, excluding the appreciation in the value of unlisted investments," Mistry said. HDFC’s total non-performing loans as on 30 September amounted to ₹ 1,063 crore, or 0.82% of its loan portfolio. This is the 27th consecutive quarter for which the percentage of non-performing loans is lower than the same quarter in the previous year. Mistry said HDFC had a balance of ₹ 1,525 crore in the provision for contingencies account after ₹ 254.68 crore was transferred additional reserves created under the National Housing Bank Act 1987. The mortgage regulator has increased provisions on both standard and non-standard assets effective August. HDFC has to keep 0.4% of the standard loans as provisions while for non-standard loans the provisions has been increased to 15% of loans from 10%, Mistry said. HDFC’s total provisions currently stand at ₹ 1,525 crore, higher than regulatory requirement of ₹ 1,196 crore.